Over millions of years, viruses and the animals that they infect have been locked in a battle for survival, where each has needed to evolve ways to counteract the effects of the other. While the evolution of ancient animals can be studied by looking at the fossilized remains of their extinct relatives, studying how ancient viruses have evolved is more difficult as they usually do not leave behind physical traces of their existence. However, a family of viruses called retroviruses is a notable exception to this rule. Retroviruses have a step in their life cycle in which their genetic material is integrated into the genome (the name for an organism’s complete set of genetic material) of the cell that they have infected. In rare cases, when that cell is a precursor of a sperm or egg cell, then the viral genes may then be passed on to the animal’s offspring, ultimately leaving genetic traces that can be studied in modern animals. This acts as a genetic ‘fossil record’ of extinct viruses. HERV-T was a retrovirus that spread among our primate ancestors for about 25 million years before its extinction roughly 11 million years ago. Blanco-Melo et al. have now analyzed the genetic remains left by HERV-T in the genomes of humans and related primates, and were able to use this information to recreate a protein that made up the outer envelope that surrounded the virus. Further experiments showed that this viral protein helped HERV-T to infect human cells by interacting with a protein called MCT1 on the cell surface. Blanco-Melo et al. also found a particular HERV-T gene that was unexpectedly well preserved in the human genome. The gene retained its ability to produce an envelope protein for about 13 to 19 million years. It is likely that ancient primates ‘hijacked’ the viral gene and used the protein it produced to remove the MCT1 protein from the surface of their own cells. Without MCT1 on the surface, HERV-T was unable to infect the cells. Thus, these findings present an example of how viruses themselves can provide the genetic material that animals use to combat them, potentially leading to their extinction. When the targets of a given retrovirus include host cells that will become part of the germ-line, viral sequences can become inherited and sometimes fixed in host populations. Indeed, about 8% of the human genome is composed of inactive or fragmented endogenous retroviruses (ERVs) (Lander et al., 2001). A few retroviral genes and regulatory DNA elements have been exapted to perform diverse host functions, such as syncytial trophoblast fusion (Lavialle et al., 2013), and transcriptional regulation (Chuong et al., 2016; Fort et al., 2014; Lu et al., 2014; Macfarlan et al., 2012; Rebollo et al., 2012; Ting et al., 1992). In particular, a number of endogenous viral elements have been shown to exhibit antiviral activity. Indeed, gag (Best et al., 1996; Murcia et al., 2007; Yan et al., 2009), env (Gardner et al., 1991; Ito et al., 2013; Kozak, 2015; McDougall et al., 1994; Robinson and Lamoreux, 1976; Spencer et al., 2003), and accessory genes (Czarneski et al., 2003; Frankel et al., 1991) from endogenous viruses have been shown to contribute to host defense against exogenous retroviruses, through a variety of mechanisms. Although some functions have been ascribed to exapted retroviral fragments, most provide no obvious advantage to their host. Nonetheless, endogenous proviruses represent a fossil record of past infections, enabling the study of ‘paleovirology’ (Emerman and Malik, 2010). In particular, the synthesis of consensus or deduced ancestral sequences based on retroviral fossils has enabled the functional analyses of reconstructed proteins from ancient, presumptively extinct, retroviruses (Dewannieux et al., 2006; Goldstone et al., 2010; Kaiser et al., 2007; Lee and Bieniasz, 2007; Perez-Caballero et al., 2008; Soll et al., 2010). Numerous members of the gammaretrovirus genus currently circulate in mammalian species, but exogenous gammaretroviruses appear absent from modern humans (Bénit et al., 2001). A key question in virology, that is potentially answerable using paleovirological analyses, is what caused the elimination of extinct viral lineages? Here, we address this question for an extinct lineage of gammaretroviruses that replicated in ancient primates (HERV-T) (Blusch et al., 1997). While no functional HERV-T genes have been found in available modern primate genomes, we show that a single HERV-T env gene was apparently exapted in hominids. 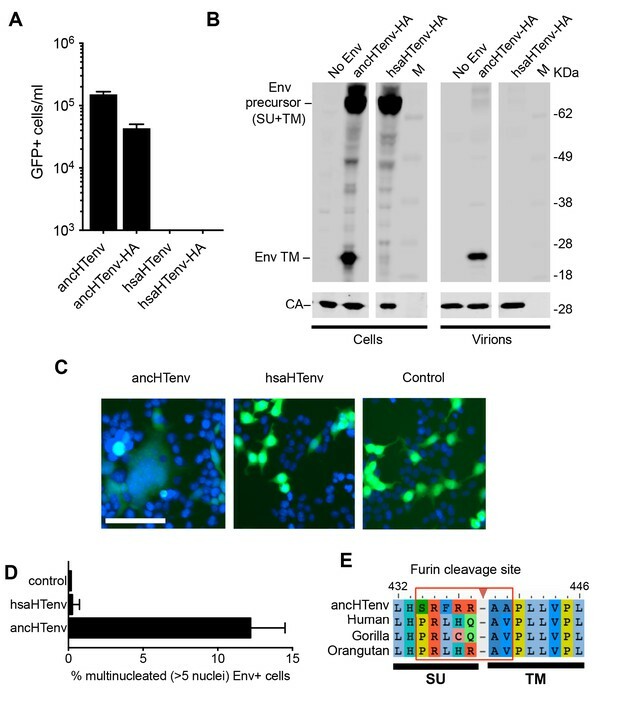 We find that the product of this HERV-T env gene can block retroviral infection mediated by a reconstructed, functional ancestral HERV-T env, by depleting the HERV-T receptor from cell surfaces. Thus, this exapted env gene may have driven the extinction of HERV-T from hominids. Using similarity search-based approaches, we constructed a comprehensive catalog of HERV-T fossils in old world monkey (OWM) and ape genomes (Figure 1—source data 1). Phylogenetic analysis of near-complete proviral elements revealed three major HERV-T clades (T1–T3), each of which was associated with phylogenetically distinct LTR sequences, (Figure 1—figure supplement 1A). Two clades (HERV-T3 and HERV-T2) were previously annotated (LTR6A and LTR6B in RepBase [Bao et al., 2015]) while a third (HERV-T1) was novel. Other HERV-T-like sequences (found by similarity to HERV-T protein-coding genes) are present in new world monkeys (platyrrhini primates) and documented in Repbase (Bao et al., 2015). The presence of orthologous HERV-T loci in various primate species, and integration dates estimated from LTR divergence (Figure 1—source data 1), indicated that the infectious ancestor of HERV-T entered primate germlines between ~43 and ~32 MY ago (MYA). Additional germline integration events occurred in various primate lineages for the ensuing 25 MY, with the most recent integrations that became fixed in primates having occurred ~11 MYA in hominids and ~8 MYA in macaques (Figure 1—source data 1). Comparison of recovered HERV-T fossils indicated that the HERV-T2 clade derives from a single, hypermutated HERV-T1 element (Figure 1—figure supplement 1B), and likely expanded by complementation in-trans. HERV-T3 represented the oldest HERV-T clade in catarrhini primates, with integration dates ranging from ~8 to ~30 MYA, and had the highest overall copy number (Figure 1A and Figure 1—source data 1). There was some support for the division of HERV-T3 into two sub-clades (Figure 1—figure supplement 1A). Using a maximum likelihood approach we inferred the sequence of an infectious ancestral HERV-T3 from near complete proviruses (Figure 1A and Figure 1—source data 1). Unlike fossilized viral elements, the reconstructed ancestral sequence had gag, pol and env genes with full coding potential, and revealed the likely presence of an additional open reading frame (ORF) of unknown function, located 5’ to gag (Figure 1B and Figure 1—figure supplement 2). We tested the functionality of the reconstructed ancestral HERV-T envelope gene (ancHTenv, Supplementary file 1) by generating murine leukemia virus (MLV) particles containing a gfp reporter vector and pseudotyped with ancHTenv. MLV-ancHTenv virions were able to infect many cell lines at high titer (105–106 infectious units (IU)/ml, Figure 1C) while some rodent (NIH3T3 and Rat2) and chicken (DF-1) cells were comparatively resistant to MLV-ancHTenv (titers ≤ 103 IU/ml). Functional reconstruction of a ~32 MY old HERV-T envelope protein. (A) Phylogenetic tree of HERV-T3 proviral sequences in OWM and apes. Orthologous sequences are bracketed and estimated integration times indicated. * >90% bootstrap support. Red circle = ancestral root node. (B) Ancestral HERV-T3 genome with ORFs indicated. (C) Infectivity of MLV particles containing a GFP reporter and pseudotyped with the ancHTenv protein (Mean ± SD, n = 3 replicates). See also Figure 1—figure supplements 1–2. When challenged with an MLV-ancHTenv expressing a neo resistant gene, even DF-1 and NIH3T3 cells could be infected at low efficiency (titers of ~4 × 102 and ~1 × 103 G418-resistant colonies (G418-RC)/ml). 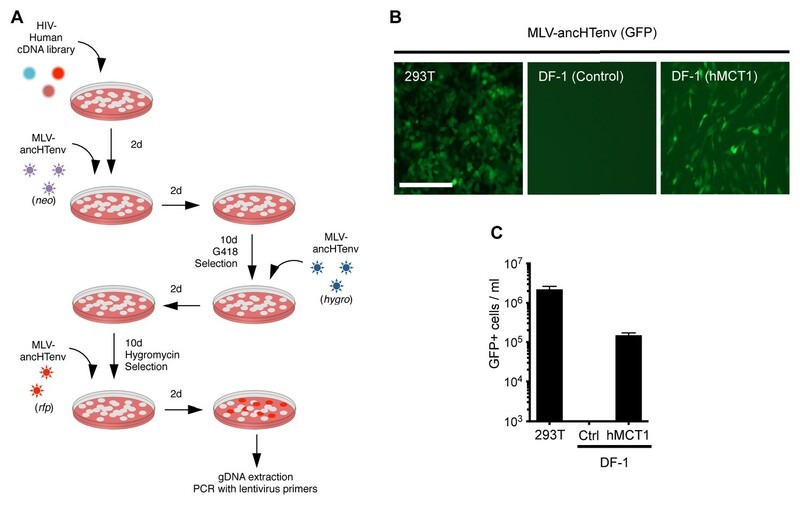 Therefore, DF-1 cells, which exhibited the lowest susceptibility to MLV-ancHTenv, were selected to identify candidate HERV-T receptors as they would give the lowest ‘background’ level of infection in the context of a cDNA library screen. We generated a lentivirus-based human cDNA library from human 293T cells, which were among the most highly permissive cell lines tested, and then iteratively challenged and selected library-transduced DF-1 cells with MLV-ancHTenv virions containing antibiotic resistance or fluorescent protein genes (Figure 2A). 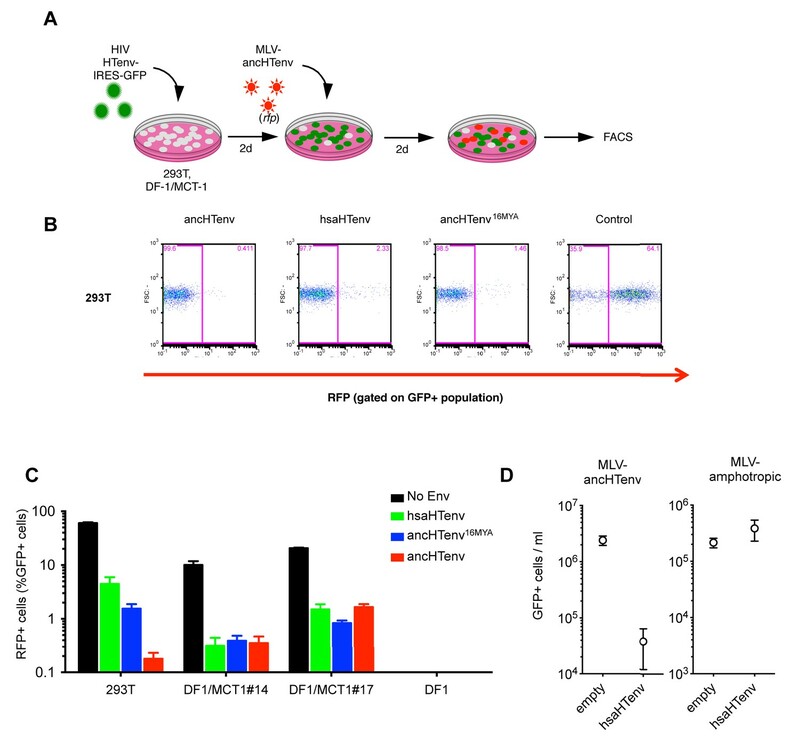 This procedure progressively enriched MLV-ancHTenv-susceptible DF-1 cells (Figure 2—figure supplement 1A). Lentiviral-vector directed PCR primers were then used to identify a human cDNA in the selected cells, that encoded human monocarboxylate transporter 1 (hMCT1, also known as SLC16A1, Figure 2—figure supplement 1B), a 12-pass transmembrane protein that mediates the transport of monocarboxylates such as lactate and pyruvate across the plasma membrane, and is upregulated in some cancers (Halestrap, 2012, 2013). Reintroduction of an hMCT1 cDNA into naïve DF-1 cells rendered them highly sensitive to infection with MLV-ancHTenv (Figure 2B and C). Moreover, MCT1 expression in DF-1 cells also conferred dramatically enhanced ability to bind to MLV Gag-GFP virus-like particles (VLPs) pseudotyped with ancHTenv, but had no effect on the low-level binding of VLPs that lacked an Env protein or incorporated an ecotropic MLV envelope (Figure 3). Thus, MCT1 was likely the receptor used by HERV-T to infect ancient old world primates. MCT-1 functions as a receptor for ancestral HERV-T.
(A) Scheme of the receptor screening strategy. DF-1 cells were transduced with a lentiviral cDNA library. Two days later, the cells were challenged with MLV-ancHTenv containing a neo gene. After a further two days, cells were placed in G418 selection. After another 10 days, G418-resistant cells were replated and challenged with MLV-ancHTenv containing a hygromycin resistance gene. Two days later cells were placed in hygromycin selection. After a further 10 days, Hygromycin-resistant cells were replated and challenged with MLV-ancHTenv containing RFP and were found to be highly susceptible to infection (Figure 2—figure supplement 1A). Genomic DNA (gDNA) was extracted from this cell population and subjected to PCR using primers specific to the lentiviral vector (Figure 2—figure supplement 1B). (B) Fluorescent micrographs of 293T and DF-1 cells, expressing hMCT1 or a control protein, following infection with MLV-ancHTenv expressing GFP as reporter. Scale bar = 200 μm. (C) Titers of MLV-ancHTenv/GFP on 293T and DF-1 cells expressing hMCT1 or a control protein (Mean ± SD, n = 2 replicates, one of two separate experiments). Binding of ancHTenv-pseudotyped MLV particles to DF1 cells expressing MCT1. (A) Fluorescent micrographs of MLV Gag-GFP VLPs pseudotyped with ancHTenv or ecotropic MLV, bound to DF-1 cells expressing hMCT1 or an empty vector. Scale bar = 5 μm. (B) Enumeration of MLV Gag-GFP VLPs bearing the indicated Env proteins bound to DF-1 cells expressing MCT-1 or an empty vector. Each data point represents an individual cell (n = 20 for each condition). Notably, the modern human genome harbors a single HERV-T provirus that includes an env gene with nearly full coding potential (de Parseval et al., 2003). This env ORF lacks only five amino acids at the C-terminus, shares 86% amino acid identity with the reconstructed ancHTenv and is expressed mainly in healthy thyroid tissue (de Parseval et al., 2003). The provirus is also present at the orthologous site in gorilla and orangutan genomes, but absent in chimpanzees due to a segmental deletion at that locus. This provirus originated from bona-fide retroviral integration (presence of a 4 bp target site duplication) into the internal sequence of another HERV (Repbase: HERVIP10FH), in a locus surrounded by other repetitive sequence elements. Sequence similarity searches using the env region suggested the absence of an orthologous insertion in non-hominid primate genomes. Moreover, the divergence between the paired LTRs of this provirus gave an estimated integration date of ~7–19 MYA (Table 1). Adjustment of this estimate to account for species distribution leads to the conclusion that this provirus was inserted into the germline of the ancestor of modern hominids at least ~13–19 MYA. Molecular evolution analyses of the provirus containing hsaHTenv in its orthologs. (1) Divergence measured in substitutions per site. (2) Integration dates inferred from the divergence of the paired LTRs for human, gorilla and orangutan proviruses. Age is calculated assuming a human neutral substitution rate of 2.2 × 10−9 substitutions per site per year. (3) Pairwise dN/dS ratios for the env genes calculated using codeml (CodonFreq = F3 × 4, Kappa and Omega estimated). (**) Significantly different from dN/dS = 1 (p<0.01). Unlike the reconstructed ancHTenv, the Env protein product of the modern human HERV-T provirus (hsaHTenv) was not able to generate infectious pseudotyped MLV particles (Figure 4A). Moreover, unlike ancHTenv-HA, the hsaHTenv-HA protein was not correctly processed and was not incorporated into viral particles (Figure 4B). Furthermore, while ancHTenv expression was able to drive syncytium formation, hsaHTenv had no fusogenic activity (Figure 4C and D). Inspection of the hsaHTenv and orthologous env sequences in gorillas and orangutans revealed mutations at the site where proteolytic cleavage by furin-like proteases generates surface (SU) and transmembrane (TM) subunits (Hallenberger et al., 1992) (Figure 4E). Insertion of these cleavage site mutations into ancHTenv abolished cleavage and pseudotype infection, while reversion of mutations in hsaHTenv did not correct the cleavage defect and did not yield infectious MLV particles (Figure 4—figure supplement 1), Thus, loss of HERV-T envelope function by hsaHTenv was a multi-step process, including loss of furin cleavability, similar to findings with feline endogenous retroviral Env proteins (Ito et al., 2016). The human genome encodes a HERV-T Env ORF that does not function as a retroviral envelope. (A) Infectiousness of MLV particles pseudotyped with untagged or C-terminally HA-tagged ancHTenv or hsaHTenv (Mean ± SD, n = 3 replicates, one of two experiments). (B) Western blot analyses (α-CA and α-HA) of cell lysates and MLV virions generated following expression of C-terminally HA-tagged ancHTenv or hsaHTenv M: markers. (C) Examples of cell fusion in 293T cell cultures expressing ancHTenv or hsaHTenv linked to IRES-GFP. Scale bar = 100 μm. (D) Percentage of GFP+ multinucleated cells (>5 nuclei/cell) in 293T cell cultures expressing ancHTenv or hsaHTenv linked to IRES-GFP (Mean ± SD, n = 3 groups of ten microscopic fields, one of two experiments) Blue: DAPI. (E) Alignment of ancHTenv and intact or nearly intact HERV-T Env protein sequences encoded by hominid genomes, proximal to the furin cleavage site. See also Figure 4—figure supplement 1. Although the hsaHTenv did not maintain function, it has retained a complete open reading frame (ORF) since its deposition in an ancestral hominid genome. To determine the degree to which this ORF preservation should be expected, we deduced an ancestral env gene sequence for this particular hominid provirus (ancHTenv16MYA) and simulated its neutral evolution using the human neutral substitution rate (Lander et al., 2001). Only 6% of sequences maintained the env ORF following simulated neutral evolution for 13–19 MY (Figure 5A). Note that 6% represents an overestimate as indels were not simulated. Strikingly, inspection of orthologous human and orangutan proviruses revealed highly selective preservation of the env ORF, while numerous stop codons (6 to 16) and frameshifts (3 to 5) were present in gag and pol genes of the same provirus (Figure 5B and Table 2). For the gorilla provirus, a single nucleotide frameshift was the only lesion in env, suggesting recent inactivation. Pairwise sequence comparisons revealed that the human and orangutan env genes show signatures of purifying selection (dN/dS ≈ 0.5, p<0.01), whereas comparisons with the gorilla env suggest a relaxed selection (Table 1). Overall, selective pressures appear to have preserved this HERV-T env ORF despite the loss of its retroviral envelope function, and numerous inactivating mutations in the accompanying gag and pol genes. Preservation of hsaHTenv and its orthologs in hominids. (A) Monte-Carlo simulations of ancHTenv16MYA evolution for 13.45–19.68 MY using a human neutral substitution rate. The percentage of 10,000 simulated sequences of each type is plotted with error bars indicating maximum and minimum estimates. (B) Distribution of stop codons (colored circles) in the Gag, Pol and Env coding sequence of proviruses orthologous to the HERV-T provirus containing hsaHTenv. Analysis of inactivating mutations of hsaHTenv encoding provirus in human, gorilla and orangutan genomes. Proviral sequences were aligned to the ancestral HERV-T3 sequence. Nonsense mutations and frameshift indels relative to the ancestral sequence were quantified. ‘Indel’ = insertion or deletion events compared to the ancestral HERV-T3 sequence that resulted in a reading frame change. ‘Stop’ = mutations that resulted in a stop codon. (*) Indicates a single nucleotide insertion that results in the truncation of the last five amino acids compared with ancHTenv. We tested the antiviral potential of the hsaHTenv and its direct ancestor in hominids (ancHTenv16MYA, Supplementary file 1) by expressing them into 293T cells, as well as DF-1 clones expressing hMCT1-HA (Figure 6A). Strikingly, hsaHTenv and ancHTenv16MYA inhibited MLV-ancHTenv infection by >10 fold in both cell lines (Figure 6B and C and Figure 6—figure supplement 1). Cell clones (293T) stably expressing hsaHTenv were ~50–100-fold less susceptible to MLV-ancHTenv as compared to control cells, but fully susceptible to amphotropic MLV infection (Figure 6D). Western blot analyses showed that hsaHTenv, ancHTenv16MYA or ancHTenv expression caused depletion of endogenous MCT1 in 293T cells (Figure 7A). In DF-1 cells, expression of hsaHTenv-HA, ancHTenv-HA or ancHTenv16MYA-HA clearly depleted Flag-tagged hMCT1 from the surface of nearly all cells examined (Figure 7B and Figure 7—figure supplement 1). In the majority of hsaHTenv-HA, ancHTenv-HA or ancHTenv16MYA-HA expressing DF-1 cells, MCT1-FLAG immunofluorescence was nearly undetectable while a few cells showed low levels of intracellular staining (a mixture of diffuse and punctate MCT1-FLAG staining) (Figure 7—figure supplement 1). Thus, these data collectively suggest that ancHTenv16MYA and hsaHTenv exhibit antiviral activity specifically against HERV-T by causing a reduction in the levels of MCT1 at the cell surface. The hsaHTenv protein specifically inhibits HERV-T infection. (A) Scheme of the antiviral assay. Cells, 293T or DF-1 expressing hMCT1, were transduced with lentiviral vectors expressing HERV-T Env proteins or an unrelated protein (No Env) together with a GFP reporter gene to monitor expression. Cells were challenged with MLV particles pseudotyped with ancHTenv that expresses RFP upon infection. Cell populations were analyzed by FACS 2 days after infection. (B) Representative experiment based on the scheme depicted in (A) conducted using 293T cells expressing the indicated Env proteins. (C) Infectivity of MLV-ancHTenv on 293T cells or two clones of MCT1-expressing DF1 cells (#14, #17), expressing HERV-T envelope proteins according to the scheme described in (A). Plots describe the percentage of RFP positive cells (infected) after gating on the GFP positive (Env-expressing) cell population. (Mean ± SD, n = 3 independent experiments). (D) Susceptibility of clones of 293T cells expressing an empty vector or hsaHTenv-HA to infection by MLV-ancHTenv/GFP or amphotropic MLV/GFP (Mean ± SD, n = 3 three independent single cell clones assayed once each). See also Figure 6—figure supplement 1. 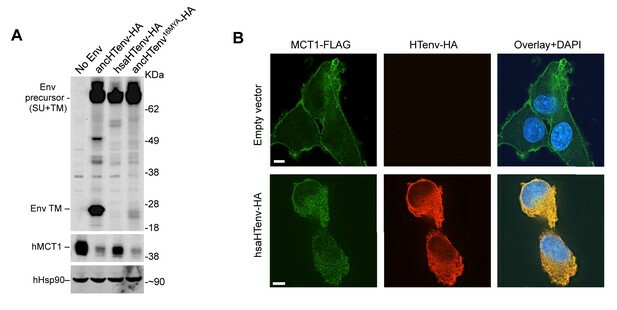 The hsaHTenv protein causes depletion of hMCT1 from the cell surface. (A) Western blot analyses (α-HA, α-hMCT1 and α-hHsp90) of 293T cell lysates generated following transduction with lentiviral vectors encoding C-terminally HA-tagged HERV-T envelopes. (B) Immunofluorescent micrographs of hMCT1-Flag-expressing DF-1 cells transduced with vectors expressing hsaHTenv-HA or an empty vector. Green: α-Flag, red: α-HA, Blue: DAPI. Scale bar = 5 μm. See also Figure 7—figure supplement 1. 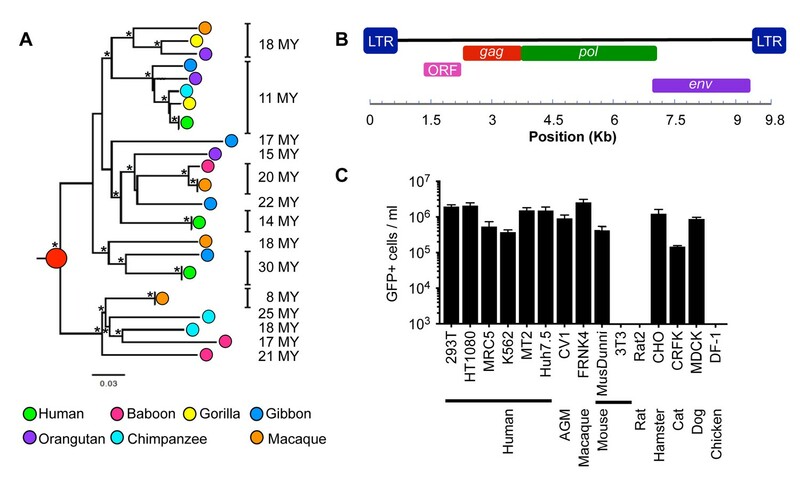 These findings suggest a scenario in which HERV-T began to infiltrate primate germ lines, using MCT1 as a receptor ~43–32 MYA. Later, ~19–13 MYA, a HERV-T Env sequence (represented approximately by ancHTenv16MYA) was exapted by ancestral hominids and to serve as an antiviral gene. AncHTenv16MYA apparently functioned by interacting with MCT1, either at the cell surface promoting its internalization, or in the secretory pathway, blocking its transport to the plasma membrane, leading to MCT1 degradation and its depletion from the cell surface. This process is analogous to the specific receptor interference phenomena observed in retroviral infections (Nethe et al., 2005) and exploited by endogenous env genes that exhibit antiviral activity in other species (Gardner et al., 1991; Ito et al., 2013; Kozak, 2015; Robinson and Lamoreux, 1976; Spencer et al., 2003). Given the fusogenic potential of ancHTenv, it is likely that the progenitor of hsaHTenv would have imposed a fitness cost on its ancestral hominid host. We speculate that the progenitor of hsaHTenv acquired mutations either concurrent with, or after, its integration that resulted in loss of its fusogenic potential (e.g. furin cleavage site mutations). This sequence (represented approximately by ancHTenv16MYA) retained full length open reading frame and MCT1 binding activity, and became fixed in the ancestral hominid population. Indeed, it is plausible that this exapted gene might have contributed to the apparent extinction of HERV-T from hominids at some point after the deposition of the most recent fixed hominid germline insertion, ~11 MYA. The selection pressures acting on hsaHTenv, its orthologs and progenitors might have been complex. Loss of fusogenicity but retention of receptor binding activity are, in a sense, opposing influences in terms of maintenance of the ORF and its function. Moreover, although some purifying selective pressure (low dN/dS) can be detected in hsaHTenv and its orangutan ortholog, a relaxation of those forces might be expected to have occurred after HERV-T extinction, perhaps leading to reduced antiviral activity observed in modern hsaHTenv. Finally, as MCT-1 is a moncaboxylate transporter that is upregulated in human cancers (Halestrap, 2013), the ability of hsaHTenv to deplete MCT1 from cell surfaces may suggest an additional or alternative metabolism-related cellular or even anti-tumor functions and selective pressures. Such an activity might have continued to shape hsaHTenv sequence independent of anti-HERV-T activity. In either case, this study highlights the potential importance of ERV proteins as raw material for the innovation of new functions in human ancestors. Screening for HERV-T elements was performed using a BLAST-based strategy implemented using the Database-Integrated Genome Screening (DIGS) tool (http://giffordlabcvr.github.io/DIGS-tool/). A HERV-T genome consensus sequence (HERV-Tcons, constructed from previously identified HERV-T sequences [Bénit et al., 2001]) was used as query to mine old world monkey (OWM) and ape genomes. Specifically, amino-acid and nucleotide sequences of the consensus HERV-T genome were used as probes for tBLASTn (RRID: SCR_011822) (gag, pol and env) and BLASTn (RRID: SCR_001598) (LTR) searches of a genome target database containing complete and low coverage primate genome sequences that were retrieved from publicly available databases: Human (GenBank: GCF_000002125.1), chimpanzee (GenBank: GCF_000001515.6), bonobo (GenBank: GCA_000258655.2), gorilla (GenBank: GCA_000151905.1), orangutan (GenBank: GCF_000001545.4), gibbon (GenBank: GCA_000146795.1), baboon (UCSC: papHam1), and rhesus macaque (GenBank: GCA_000002255.2). To avoid the identification of sequences from related but distinct retroviruses, significant BLAST hits (e-value < 1E-50) were used as probes for a second round of BLASTx (RRID: SCR_001653) (translated coding hits) or BLASTn (non-coding hits) searches against a sequence reference library containing exogenous and endogenous gammaretroviruses and other class-I ERVs (including HERV-Tcons). Exogenous retroviral sequences were retrieved from the RefSeq database (RRID: SCR_003496) (Pruitt et al., 2014), and ERV sequences were based either on consensus sequences of previously published ERV sequence data (Bénit et al., 2001; Sverdlov, 2005; Tristem, 2000; Villesen et al., 2004), or previously inferred consensus sequences (Jern et al., 2005). BLAST hits assigned to HERV-T were first ordered by genome scaffold and orientation, and adjacent or overlapping entries were assembled into proviral loci by comparison with HERV-Tcons, allowing for insertions no longer than 10,000 nt. Due to the high numbers of mutations, especially indels, accumulated in ERV sequences, 44 nearly-complete HERV-T sequences were aligned to HERV-Tcons using MUSCLE (RRID: SCR_011812) (Edgar, 2004) in a pair-wise fashion, followed by the creation of a ‘gapped’ multiple sequence alignment (MSA) using the profile alignment function. Insertions relative to HERV-Tcons were removed from the MSA, but saved in a separate file allowing for the restoration of the removed insertions if required. Maximum likelihood (ML) phylogenetic trees were constructed from a nucleotide MSA (described above) using raxML (RRID: SCR_006086) (Stamatakis, 2006) with the following parameters: rapid bootstrap analysis with 1000 replicates under the GTRCAT model followed by a ML search under GTRGAMMA model to evaluate the final tree topology (-m GTRCAT -# 1000 -x 13 k -f a). Phylogenetic trees were then analyzed using FigTree v1.4.2 (RRID: SCR_008515) (Rambaut, 2008). Thereafter, the tree was rooted using a platyrrhini HERV-T-like sequence as outgroup. The resulting tree showed three monophyletic HERV-T clades (corresponding to HERV-T1, HERV-T2 and HERV-T3 in old world primates) whose LTR sequences were clearly distinct. Consensus sequences were derived from each clade and used to re-classify the results from the primate genome screening. Dates of integration for HERV-T elements were calculated using PAUP* (RRID: SCR_014931) (Swofford, 2002) by determining the divergence (K) from: (i) the corresponding consensus sequence (for soloLTRs), or (ii) to their cognate LTR (for proviral loci flanked by paired LTRs). The resulting K was divided by two times the neutral substitution rate (r) in order to obtain the estimated integration date (K/2r) (Lebedev et al., 2000; Subramanian et al., 2011). The human neutral substitution rate used was 2.2 × 10−9 substitutions per site per year (Lander et al., 2001). APOBEC3-derived hypermutation analysis and statistics were performed using Hypermut 2.0 (RRID: SCR_014933) (Rose and Korber, 2000) on 49 gag-pol-env HERV-T containing sequences in OWM and ape genomes using default parameters. HERV-T sequences with p-value<0.05 in a Fisher exact-test, were treated as significant for APOBEC3- derived hypermutation. dN/dS (ω) ratios were calculated on a pairwise basis, by comparing the aligned codon sequences of the human, gorilla (after artificially removing a 1nt frame-shift insertion) and orangutan env genes, using codeml from the PAML package of programs (RRID: SCR_014932) (Yang, 1997) (runmode = −2, CodonFreq = F3 × 4, Kappa and Omega estimated). Likelihood ratio tests were performed by comparing the log likelihood of the estimated ω (L1) to the log likelihood when ω was fixed to 1 (L0, neutral selection). The probability (P) of twice the difference (D = 2(L1−L0)) was calculated using a chi-squared distribution (degrees of freedom = 1). For the ancestral reconstruction of HERV-T3, we first analyzed the 5’ and 3’ flanking sequences of 22 near complete HERV-T3 proviruses retrieved from old world monkey and ape genomes. These analyses resulted in fourteen unique HERV-T3 integration events (orthologous groups). Ancestral nodes for each orthologous group were used for the ancestral reconstruction. Initial ML ancestral reconstructions were guided by a MSA together with a phylogenetic tree using baseml (PAML (RRID: SCR_014932) (Yang, 1997), model: REV, branch lengths were used as initial values). Initial values of alpha and kappa were calculated on the MSA by jmodeltest (Darriba et al., 2012). A correction for the effect of methylation-induced mutations at CpG dinucleotides was applied on both strands of all ancestral reconstructed sequences as previously described (Goldstone et al., 2010). The resulting ancestral HERV-T3 sequence was further refined in two locations. A single nucleotide insertion, relative to the ancestral HERV-T1 sequence, was eliminated in the 5’ pre-gag ORF resulting in the suppression of a frame-shift mutation and an expansion of 43 codons relative to the original ancestral HERV-T3 sequence. Additionally, the state of particularly polymorphic si﻿tes in the pre-gag ORF was hand curated by a combination of their frequency and the phylogenetic relationships between the corresponding HERV-T3 sequences. The variation present in HERV-T1 sequences was used to break possible ties. A similar procedure was performed on the initial HERV-T3 ancestral env sequence with the additional consideration that if the CpG reversion procedure, at a particular position, resulted in the change in chemical nature of the amino acid, the residue at this position was reverted to its ‘pre-CpG reversion’ state. The final revised sequence corresponded to ancHTenv (Supplementary file 1). The ancestral reconstruction for ancHTenv16MYA (Supplementary file 1) was performed manually by selecting residues based on the phylogenetic relationships of the three Env sequences present in human, gorilla and orangutan. Polymorphic sites were resolved by comparison with the ancHTenv sequence. Characterization of the hsaHTenv orthologs in other primate species and the ~196 Kb segmental deletion in the Chimpanzee genome, was done using the UCSC genome browser (RRID: SCR_005780) (Kent et al., 2002) and tools implemented therein. Stop codon analysis was performed by translating the proviral sequences in all three forward reading frames and the location of their stop codons was plotted using R (RRID: SCR_001905). Frameshift mutations were identified by aligning proviral sequences to the ancestral HERV-T3 sequence. Monte-Carlo simulations of in﻿ silico neutral evolution on the ancHTenv16MYA were performed using seq-gen (RRID: SCR_014934) (Rambaut and Grassly, 1997) under the GTR model (10,000 iterations) as previously described (Katzourakis and Gifford, 2010). Expected branch lengths were calculated for the minimum and maximum estimates of the origin of hominids (13.45 and 19.68 MY respectively) (Perelman et al., 2011) using the neutral substitution for humans. The simulated 10,000 sequences were then evaluated for the presence of a 5’ methionine and premature stop codons. Analysis for the features of HERV-T envelope sequences was performed using tmhmm 2.0 (RRID: SCR_014935) (Krogh et al., 2001) for transmembrane and hydrophobic domains, and ProP1.0 (RRID: SCR_014936) (Duckert et al., 2004) for signal peptide and propeptide cleavage sites. The codon-optimized sequences for expression in human cells of ancHTenv, hsaHTenv (GenBank: AB266802) and ancHTenv16MYA were synthesized (Genewiz, South Plainfield, NJ) and subsequently inserted into the pCAGGS expression vector (Niwa et al., 1991) using EcoRI and XhoI (NEB, Ipswich, MA) restriction enzymes. Furin cleavage site modified HERV-T envelopes were generated by exchanging the furin cleaveage sites of ancHTenv and hsaHTenv, and vice versa. Specifically, mutagenic PCR primers that annealed to sequences encoding the respective furin cleavage sites were used in overlapping PCR reactions, resulting in the generation of ancHTenv-FurinMut (SRFRRAA to PRLHQAV) or hsaHTenv-FurinFix (PRLHQAV to SRFRRAA). The PCR reactions were treated with DpnI (NEB, Ipswich, MA) restriction enzyme for an hour at 37°C to eliminate plasmid DNA. The complete PCR fragment was inserted into pCAGGS using EcoRI and XhoI restriction sites encoded in the outer primers. HA-tagged HTenv expression plasmids were generated by introducing two copies of an HA-tag at the C-termini of all HERV-T envelopes using PCR and primers containing the tag DNA sequence and a 15nt linker sequence. The complete PCR fragments were inserted back into pCAGGS using EcoRI and XhoI restriction sites contained in the PCR primers. HA-tagged HERV-T envelope constructs were also subcloned into pCCIB (a lentiviral expression vector containing a CMV-promoter and IRES-blasticidin resistance cassette), using SfiI (NEB, Ipswich, MA) restriction sites contained in the PCR primers, to generate stably-expressing cell lines and clones. HA-tagged HERV-T envelope constructs or a control protein (GFP) were also subcloned into pCCIGW (lentiviral expression vector containing a CMV-promoter and IRES-GFP), using SnaBI and BstXI (NEB, Ipswich, MA) restriction sites contained in the PCR primers. The sequence encoding human MCT1 (hMCT1, UniProt: P53985) was amplified from the gDNA of DF-1 cells that had been transduced with a 293T cDNA library and selected as described below. The amplified hMCT1 sequence was inserted into pCCIB utilizing SfiI sites, and the resulting vector used to generate stable DF-1 cell lines expressing hMCT1. C-terminally HA-tagged or Flag-tagged versions of hMCT1 were generated using PCR with primers containing two HA-tag or three Flag-tag encoding sequences and a 15nt linker sequence. The complete PCR fragment was inserted back into pCCIB using SfiI restriction sites contained in the PCR primers. All cells were purchased from ATCC (Manassas, VA), except MT2 (RRID: CVCL_2631) and NIH3T3 (RRID: CVCL_0594) that were obtained through the NIH AIDS Reagent Program, and Huh7.5 (RRID: CVCL_7927) that were a gift from Charles M Rice, where they were derived. Cells were assumed to be authenticated by their respective suppliers and were not further characterized. Cells were maintained in Dulbecco’s Modified Eagle Medium (DMEM) (293T (RRID: CVCL_0063), DF-1 (RRID: CVCL_0570), HT1080 (RRID: CVCL_0317), K562 (RRID: CVCL_0004), Huh7.5, FRhK4 (RRID: CVCL_4522), MusDunni (RRID: CVCL_9125), NIH3T3 and Rat2 (RRID: CVCL_0513)), Eagle’s Minimum Essential Medium (EMEM) (MRC5 (RRID: CVCL_0440), CV-1 (RRID: CVCL_0229), CRFK (RRID: CVCL_2426) and MDCK (RRID: CVCL_0422)), Roswell Park Memorial Institute medium (RPMI) (MT2), or Ham’s F-12 media (CHO (RRID: CVCL_0214)) supplemented with 10% FBS or BCS (NIH3T3), 1 mM of L-glutamine (CHO) and gentamycin (2 µg/ml) (Gibco, Waltham, MA) according to ATCC instructions. Mycoplasma testing was not specifically performed, but many cell lines were used in immunofluorescence assays with DAPI staining that should reveal presence of mycoplasma. All cells were incubated at 37°C except DF1 that were incubated at 39°C. To generate stable cell lines, 293T cells were transfected with plasmids expressing HIV-1 Gag-Pol (pCRV1 [Zennou et al., 2004]), VSV glycoprotein and pCCIB plasmids encoding hMCT1 or HA-tagged/untagged versions of HERV-T envelopes using polyethylenimine. In every case virus/vector containing supernatants were harvested and filtered two days after transfection and were used to transduce naïve 293T or DF-1 cells. Transduced cells were expanded in 10 cm dishes with media supplemented with 5 µg/ml (293T) or 20 µg/ml (DF-1) blasticidin S (Thermo Fisher Scientific Inc., Waltham, MA) and were monitored from 3 to 10 days before performing experiments or isolating single cell clones. MLV particles pseudotyped with MLV amphotropic (MLV-A) or ecotropic (MLV-E), and different HERV-T envelopes were generated by co-transfecting 293T cells with (i) the corresponding envelope plasmids, plasmids (ii) expressing MLV gag-pol polyprotein (MLVgp) and (iii) an MLV vector encoding a neo gene and/or GFP/RFP (pCNCG/pCNCR) (Soneoka et al., 1995) using polyethylenimine. Viruses were harvested and filtered (0.22 µm) two days after transfection. Viral stocks were concentrated using the Amicon Ultra-15 filters (10 kDa) (Millipore, Billerica, MA) before freezing. Cells of interest were infected with serial dilutions of the corresponding virus supplemented with 4 µg/ml of polybrene. Viral titers were calculated by measuring the percentage of infected cells expressing GFP or RFP, 2 days post infection (dpi) using the Guava EasyCyte flow cytometer (Millipore). For MLV particles expressing neo resistance genes, viral titers were calculated by expanding the infected cells in 10 cm dishes with media supplemented with 1 mg/ml (NIH3T3) or 2 mg/ml (DF-1) of G418 and monitoring for 10 days before resistant colonies were counted. Total RNA was isolated from a confluent 10 cm dish of 293T cells using Trizol (Invitrogen, Carlsbad, CA). mRNA transcripts were enriched using Oligotex polyA+ resin (Qiagen, Hilden, Germany). Polyadenylated RNA was used to construct a cDNA library using the SMART cDNA Library Construction Kit (Clontech, Mountain View, CA). Briefly, cDNA containing SfiI restriction sites was synthesized using the SMARTScribe MMLV reverse transcriptase (Clontech) with SMART primers. The resulting cDNA was further amplified for 15 cycles using Phusion High-Fidelity DNA Polymerase (Thermo Fisher Scientific Inc.) using SMART primers. PCR products were treated with Proteinase K (Clontech) for 20 min at 45°C before they were digested by SfiI restriction enzyme for 2 hr at 50°C. Digested cDNA was then size fractionated using CHROMA SPIN-400 columns (Clontech). The cDNA containing fractions (>500 bp) were selected to ligate into a pCCIB plasmid encoding corresponding SfiI sites. Overnight ligation was performed using T4 DNA ligase (NEB) and the library was expanded by transformation into electrocompetent DH5α bacteria cells. The 293T cDNA library had a complexity of 3.5 × 106 colony forming units. Transformed bacteria were cultured as suspended colonies in 6 liters of SeaPrep soft agarose (Lonza, Basel, Switzerland) diluted in 2x LB media at 30°C for 2.5 days. Thereafter plasmid DNA was extracted and used for receptor cloning. Lentiviral vector stocks carrying the cDNA library were produced by transfecting 6 × 106 293T cells with plasmids expressing HIV-1 gag-pol polyprotein (pCRV1), VSV glycoprotein and the cDNA library plasmid (pCCIB). Library containing supernatants were harvested, filtered (0.22 µm), concentrated (Amicon Ultra-15 filters 10 kDa, Millipore) and frozen two days after transfection. DF-1 cells were transduced with the library at an MOI of ~8. Transduced DF-1 cells were then challenged with MLV particles pseudotyped with ancHTenv and containing a neo resistance gene (pCNCG) two days later. Infected DF-1 cells were placed in G418 selection at 2 dpi and resistant colonies were collected after 10 days. G418 resistant DF-1 cells were then challenged with ancHTenv pseudotyped MLV particles containing a hygromycin resistance gene (pLHCX). Cells were placed in hygromycin selection at 2 dpi and resistant colonies were collected after 10 days. Hygromycin resistant DF-1 cells were infected with ancHTenv pseudotyped MLV particles expressing RFP (pCNCR) and found to be susceptible to infection. Genomic DNA (gDNA) was extracted from this DF-1 cell population and possible receptor candidates were amplified using PCR and primers directed to the pCCIB vector sequences flanking the SfiI cDNA insertion site. A non-coding isoform of human atg12 and hMCT1 were amplified from gDNA of transduced and selected DF-1 cells. For all PCRs performed in this study Phusion High-Fidelity DNA Polymerase was used. Fluorescent MLV VLPs were generated by co-transfecting 293T cells with a plasmid (pCAGGS) expressing MLV Gag-GFP and a plasmid (pCAGGS) expressing ancHTenv, MLV-E or an empty vector, using polyethylenimine. VLPs were harvested and filtered (0.22 µm) two days after transfection and concentrated using the Amicon Ultra-15 filters (10 kDa, Millipore). The VLP binding assay was performed as previously described (Soll et al., 2010) using naïve DF-1 cells or a DF-1 clone expressing untagged hMCT1. Fluorescent microscopy images of the cells were acquired using a DeltaVision deconvolution microscope (GE Healthcare, Port Washington, NY). A Z-series of images (capturing the entire thickness of the cell monolayer) were flattened onto a single image and the number of fluorescent particles associated with each cell was counted for 20 distinct cells. To determine the number of fluorescent VLPs added to the cells, 80 µl of the VLP-containing supernatant was was layered onto 1 ml of 20% sucrose in PBS followed by centrifugation at 20,000 x g for 90 min at 4°C. Pelleted VLPs were resuspended in 300 µl of PBS and filtered (0.22 µm). Two-fold serial dilutions of the VLPs (in PBS) were layered (100 µl) to poly-D-lysine coated glass coverslips and left overnight at 4°C. Fluorescent microscopy images of the VLPs were analyzed using the DeltaVision software (GE Healthcare) to determine the number of VLPs/ml for each condition. The number of fluorescent particles bound to cells was then calculated as a proportion of the number of fluorescent VLPs added to the cells. Cell lysates and pelleted virions (600 µl of supernatant pelleted through 20% sucrose in PBS) were resuspended in SDS-PAGE loading buffer, with the addition of 0.5% β-mercaptoethanol, and resolved on NuPAGE Novex 4–12% Bis-Tris Mini Gels (Invitrogen) in MOPS running buffer. Proteins were blotted onto nitrocellulose membranes (HyBond, GE-Healthcare) in transfer buffer (25 mM Tris, 192 mM glycine). The blots were then blocked with Odyssey blocking buffer and probed with rat monoclonal anti-MLV capsid (RRID: CVCL_9230, ATCC, R187), rabbit polyclonal anti-HA (RRID: AB_217929, Rockland Immunochemicals, Pottstown, PA, 600-401-384), mouse monoclonal anti-HA (RRID: AB_2314672, Covance, Princeton, NJ, MMS-101P), mouse monoclonal anti-hMCT1 (RRID: AB_10841766, Santa Cruz Biotechnology Inc., CA, sc-365501), rabbit polyclonal anti-hHsp90 (RRID: AB_2121191, Santa Cruz Biotechnology Inc., CA, sc-69703) or mouse monoclonal anti-Flag (RRID: AB_262044, Sigma-Aldrich, St. Louis, MO, F1804). The bound primary antibodies were detected using a fluorescently labeled secondary antibody (IRDye 800CW or 680W Goat Anti-Mouse or anti-Rabbit Secondary Antibody, LI-COR Biosciences, Lincoln, NE, RRIDs: AB_621842, AB_621840, AB_10796098, AB_621841). Fluorescent signals were detected using a LI-COR Odyssey scanner (LI-COR Biosciences). Stable cell populations or single cells clones expressing a particular HA-tagged HERV-T envelope and/or Flag-tagged/untagged hMCT-1 were seeded one day prior to immunofluorescence assay. Cells were fixed with 4% PFA for 30 min followed by treatment with 10 mM glycine (diluted in PBS) for another 30 min. Cells were permeabilized with a PBS containing 0.1% Triton X-100% and 5% goat serum for 15 min. Cells were then washed twice with PBS before being incubated with rabbit anti-HA and mouse anti-Flag antibodies diluted in PBS containing 0.1% Tween-20% and 5% goat serum for 2 hr at room temperature. Cells were washed three times with PBS before being treated with goat anti-mouse and/or anti-rabbit secondary antibody (Alexa Fluor 488 and/or 594 dye, Life technologies, CA, RRIDs: AB_2534091, AB_2534088, AB_2534095, AB_2576217) diluted in PBS containing 0.1% Tween-20% and 5% goat serum for 1 hr at room temperature. DNA was stained with 50 μg/ml of DAPI (diluted in PBS) (Invitrogen) for 5 s. Cells were washed three more times with PBS and fluorescent microscopy images were analyzed using the a DeltaVision microscope (GE Healthcare) or the EVOS FL Cell Imaging System (Thermo Fisher Scientific Inc.). Viruses were generated in 293T cells transfected with plasmids expressing HIV-1 gag-pol polyprotein (pCRV1), VSV glycoprotein and pCCIGW (IRES-GFP) plasmids and expressing the various HERV-T envelopes described above, or an unrelated protein as control (SIVgab Nef) using polyethylenimine. Viruses were harvested and filtered (0.22 µm) two days after transfection and were used to transduce 2 × 105 naïve 293T cells or 1 × 105 DF-1 clones expressing HA-tagged hMCT1. Transduced cells were expanded in 10 cm dishes until reaching confluency. Afterwards, serial dilutions of MLV expressing RFP (pCNCR) pseudotyped with ancHTenv were used to infect 1 × 104 transduced cells in 96 well plates. Two days post infection the number of GFP+, RFP+ and double positive cells were counted by FACS using a CyFlow space cytometer (Partec, Görlitz, Germany). The resulting data was analyzed with the FlowJo analysis software. The percentage of RFP positive cells was calculated after gating on the GFP positive population. 293T cells were transduced with a lentivirus vector (CCIGW) expressing various HERV-T envelopes or a control protein (SIVgab Nef) (described above) and then fixed and stained with DAPI (described above). Multinucleated cells (>5 nuclei) and cells expressing the GFP reporter (indicative of the expression of the corresponding HERV-T envelope) were counted in three groups of ten microscopic fields and the number of multinucleated GFP+ cells as a percentage of the total number GFP+ cells was calculated for each condition. Protein Engineering Design and Selection 17:107–112. Cell Host & Microbe 8:248–259. Molecular Aspects of Medicine 34:337–349. Philosophical Transactions of the Royal Society B: Biological Sciences 368:20120507. Tree figure drawing tool, FigTree v1.4.2, http://treebioedacuk/software/figtree/. Annual Review of Genetics 46:21–42. Thank you for submitting your article "Co-option of an endogenous retrovirus envelope for host defense in hominid ancestors" for consideration by eLife. Your article has been favorably evaluated by Wenhui Li (Senior Editor) and three reviewers, one of whom is a member of our Board of Reviewing Editors. The following individual involved in review of your submission has agreed to reveal his identity: Welkin E Johnson (Reviewer #2). In this manuscript, Blanco-Melo et al. utilize comparative analysis of 'fossilized' endogenous retroviruses of the HERV-T group from human and ape genomes in order to deduce the putative ancestor, and then elegantly demonstrate the ability of its envelope to infect a variety of cell lines when pseudotyped with MLV. The authors identify a candidate human receptor, MCT-1, by challenging very low permissive cells (DF-1) transduced with a cDNA library constructed from highly permissive cells (293T) with ancestral ERV-T env pseudotyped virions; reintroduction of the MCT-1 cDNA alone rendered DF-1 highly permissive to infection mediated by the ancestral envelope. The authors investigate a HERV-T locus that has, quite remarkably, retained its env ORF in humans despite millions of years of evolution, suggesting selective pressures acting on the HERV-T env. Blanco-Melo et al. show that this env is not fusogenic and is not able to infect cell lines that are otherwise sensitive to the ancestral ERV-T env. Endogenous levels of MCT-1 are depleted in the presence of either the HERV-T env or its direct ancestor, and expression of the constructs in MCT-1 expressing cells reduced infection from ancestral ERV-T env pseudo typed MLV, suggesting antiviral protective effects from this exapted viral gene. The manuscript expands the number of known receptors used by this particular "type" of envelope glycoprotein, which is characterized by covalently linked SU and TM domains, and raises the issue of whether the phenomenon of exaptation of ERV as resistance genes is a widespread phenomenon – although the paper only amounts to proof in principle for the exaptation story, it sets a standard for how Erv glycoproteins should be investigated. It will be interesting to see whether the patterns observed here are unique to HERV-T or represent a predictable pattern among other ERV in other vertebrate lineages. Altogether, this is a very nice study. The work from Blanco-Melo is compelling and the experimental quality is high. The findings are novel and suggest a scenario of evolutionary preservation of the HERV-T env to confer antiviral protection in primate ancestors following germline invasion of primate ancestors starting ~43-32 mya (and thereby leading to HERV-T extinction), consistent with observations of receptor interference in other retroviruses and exaptation of env for antiviral purposes in other species. The work is very nicely done and concise in presentation and in its findings and interpretation(s) therein. The work clearly offers fundamental biological insight on the basis of the importance and impact of viral proteins in the mechanisms that shape the evolutionary arms race with the host, and the utility of such endogenous sequences as raw material for exaptation in the host. The findings are novel and infer clear biological importance. The conclusions presented by Blanco-Melo et al. are clear and are justified by the experimentation. Likewise, the experiments are designed succinctly to directly test and in turn support the authors' overall hypothesis. In my opinion, there are not major concerns that should impede publication of the work, although minor concerns are pointed out below. 1) The authors estimate HERV-T to have begun germline invasion ~43-32 mya, and estimate the HERV-T3 clade insertions, as a group, from ~8-30 mya; the insertion containing the preserved env reading frame was placed at ~7-19 mya, and then adjusted based on species distribution. The age estimation for the 'most recent' hominid insertion is then given in the Discussion as ~11mya. Is this value as obtained for the adjusted estimation for the insertion? Is this meant to suggest that insertion was the last ERV-T to enter the hominid line? 2) In Figure 4C the authors show depletion of endogenous MCT-1 in 293T cells in the presence of the ancestral ERV-T and HERV-T envelope proteins. I am curious about the relative levels of depletion between the various envelope proteins. MCT-1 appears to be comparatively less in the presence of the ancestral envelopes than in the hsaHTenv; This would imply the contemporary human hsaT env has, over time, lost at least some MCT-1 interference. In terms of the evolution of the envelope protein and receptor does this suggest the ancestral forms are 'better' at targeting MCT-1? 3) The experiments showing that HERV-T envelope expression can block infection are convincing, but I have some concerns with the evidence that the hsaHTenv ORF was maintained due to selective pressure. The evolution simulation results are interesting, but not very informative without knowing the number of HERV-T proviruses in the genome, e.g. if there were 20 HERV-T env ORFs that integrated during that time period, on average we would expect one ORF to be maintained by chance, according to this simulation. The analysis is further complicated by the presence of older proviruses that would have had a smaller, but non-zero probability of having their env ORFs preserved to the present day by chance. It would be helpful to have information on dN/dS ratios for these sequences – if this gene has been exapted some level of purifying selection would be expected. If its only function was to protect against a long-extinct virus the selective pressures would have been relaxed since then, which might obscure the signs of selection somewhat, but it seems likely that at least some signature of selection at the residue level would remain. 4) For reasons that are unclear to us, this paper was submitted as a Short Report, although it contains much more than the "single series" of experiments specified for this format. The result is that some results that could be included in the results are relegated to supplemental, and both the Introduction and Discussion are severely constrained. There is a reasonably rich body of literature on exaptation of endogenous viruses that prevent infection by exogenous retroviruses that is barely mentioned here. These include not only the ALV and MLV case briefly mentioned in the Discussion, which, like HERV-T encode blocking env proteins, but also MMTV and JSRV which use very different mechanisms. Also, worth discussing is the possible contribution of the furin cleavage mutations or the C-terminal deletion in exaptation. The reader is shortchanged by the brevity enforced by the format. 1) The authors estimate HERV-T to have begun germline invasion ~43-32 mya, and estimate the HERV-T3 clade insertions, as a group, from ~8-30 mya; the insertion containing the preserved env reading frame was placed at ~7-19 mya, and then adjusted based on species distribution. The age estimation for the 'most recent' hominid insertion is then given in the Discussion as ~11mya. Is this value as obtained for the adjusted estimation for the insertion? No, the ~11 MYA age estimate is based on the divergence of paired LTRs in near complete fossilized proviruses (Figure 1A and Figure 1—source data 1). These data suggest that the most recent insertions occurred about 11MYA, with one noticeable outlier. This is indicated at the end of the first paragraph of the Results section, “with the last detectable integration having occurred ~8 MYA” (Figure 1A). This outlier is found only in macaques, not hominids.” We have changed the wording at the end of the first paragraph of the Results section, and in the Discussion to be clearer on this point. Is this meant to suggest that insertion was the last ERV-T to enter the hominid line? We did not intend to suggest that the 11MYA and 8MYA integrations are the last to have occurred in primates, however we concede that the wording in the original draft did suggest this. We can reasonably state that 11MYA and 8MYA are estimates for the dates at which the most recent integrations that became fixed in ancestral primates occurred. It is possible that additional more recent integrations occurred that never became fixed and were purged from primates, and are thus invisible to us. Again, we have amended the wording in the first Results paragraph and the Discussion to be more explicit about this. We agree that the absence of recent selection pressure on hsaHTenv (after the “extinction” of HERV-T) and/or a possible additional neofuctionalization to perform a distinct but related function (e.g. metabolic modulation) might result in hsaHTenv being less potent at MCT1 downregulation than the ancestral reconstructed proteins. However, our data is actually a little ambiguous on this point – the ancestral forms appear more potent antiviral proteins than hsaHTenv in 293T cells, but roughly equivalently active in DF1/MCT1 cells (this might reflect differences in MCT1 expression levels in the two systems). This ambiguity led us to leave out a discussion of this point in the original paper – however we recognize that it perhaps should have been discussed and we have mentioned it in the revision. A) We agree with the reviewers that (dN/dS) analyses could add support to the notion that hsaHTenv has been preserved. Due to the small number (three) of orthologous integrations for this locus (Human, Gorilla and Orangutan), we performed pairwise comparisons between these sequences and included the results in Table 1. Briefly, we found signs of purifying selection (dN/dS < 1) between the human and orangutan sequences that, unlike the gorilla sequence, show a preserved env ORF. This result is consistent with the notion the purifying selection acted on this gene following its insertion into ancestral hominids. Note that a possible need to inactivate fusogenenicity would mitigate against the detection of purifying selection at this locus. B) While it is true that ~1:20 env genes of the same age would be expected to be preserved by chance, and the presence of older proviruses slightly complicates the interpretation of our simulations, this argument makes the assumption that there is no penalty (fitness cost) associated with expression of an intact env gene – which we think is unlikely, given that ancHTenv is fusogenic this is mentioned in the revised Discussion. C) We note the quite striking difference in the number of inactivating mutations in the Gag and Pol genes of the orthologous provirus as compared to Env. This observation, we think, significantly strengthens the argument that hsaHTenv was selectively preserved. D) We also note that the hsaHTenv and orthologous orangutan and Gorilla sequence are mutated in a similar way – i.e. at the SU-TM boundary, preserving receptor binding, but inactivating fusogenicity. We concede the original manuscript was a little terse, and that some data was relegated to supplementary figures so as to fit into the short report format. We have modified the manuscript to the standard manuscript format. © 2017, Blanco-Melo et al. Primates have co-opted a viral gene to produce an envelope protein that prevents infection by the HERV-T virus and likely contributed to the extinction of this virus.